Discovery of a post-impact rhyolitic volcanism at the northern margin of a granit core near Araguainha (Mato Grosso, Goias, Brasil). Geological reinterpretation of an old SLAR of this ringstructure. Based on recentl aboratory data, we have been able to put forward, in an ovcrall regional geological context, a new geological reinterpretation of the SLAR image provided with the first geological and photogeological studies (Crosta, 1981, 1983). These different studies have led not only to a confirmation of older important data regarding the impact of the end oh the Permian (Theilen-Willige, 1981; Crosta, 1981; Von Engelhardt,1992, 1998; Deutsch, 1992) but also to place this granite structure, originally formed during the Upper Ordovician (Ashgillian) Ocloyica orogeny (Deutsch,1992), in a over all context of this key arca of SouthAmerica. We are presently able to analyse the evolution of this zone during a pre-impact period (Cambro-Ordovician tothe end of the Permian in the region of Cuiaba-Araguainha). We also have a better understanding of the order of tectonic and magnetic events, together with the mechanical effect of the impact of the meteorite on the strata in particular at the end of the Upper Perniam and the Lower to Middle Triassic (247-245 +3Ma). 1. A mixture of rhyolitic and dacitic breccia fragments and tuff and even divitrified volcanic material was detected at the northern periphery,outside the impact breccias. The volcanic components are often intermixed with the impact breccias as described by the authors. Fragments of the original granite core were even present, deformed, in some samples from the periphery of the ring of impact breccias. 2. 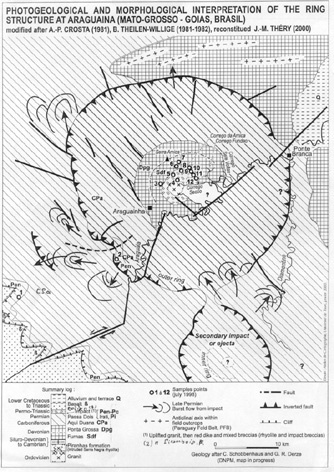 Were able at present to establish an order of events which followed the moment of impact with the propagation of shock waves from the Lower Devonian Furnas Formation up to the top of the Passa Doris Formation which can be observed in the field in the outer rim south of Araguainha (Tatarian-Kazanian?). 3. We have been able to begin the post-impact study on field samples regarding the stratigraphy and paleogeography (route Araguainha-Alto Garças-Montevidiu). The morphological and paleogeological reinterpretation of published data (Crosta, 1981) showed in fact that this structure observed on the SLAR image was initially Ordovician, belonging to an Ordovician trend know in the Cuiabo-Piranhas zone and which continues as far as the NNW side oh the Araguainha structure. It is, in fact, part of the“Paraguaian Fold Belt (“Ceinture Plissée Paraguayenne”, Trompette, 1984). This fold belt isdescribed from the base the Paleozoic and continues into the Siluro-Devonian along a much older continental margin, studied in Argentina and Boliviaas well as at Mato Grosso. This margin was closed by the closure of the Siluro-Devonian rift along the Transbrasilian lineament between the Upper Devonianand Upper Permian. At the end of the Perniam “reddikes”, composed of granite breccias and fragments,were formed in the granite core which was up lifted and recrystallized by the impact (Von Engelhardt,1992).These dikes are without doubt contemporaneous with the acid volcanic breccias and tuffs in the periphery,formed at the end of Permian. Abstract.Thanks to the support of Dr Mario Carvalho of theGeological Survey of Goias, Brasil, we were able toobtain access to new outcrops and field samples chosenby Dr Alvaro Crosta in July 1998.